Since the amount of data has grown massively in last few years, the task of obtaining relevant information has become a challenge. Recommendation engines are one solution to such problem, where they aim to deliver accurate and relevant pieces of information to the users. Recommendation engines are widely observed today, for example – youtube’s video suggestions lists, amazon’s recommended products and facebook’s friends and ads suggestions. 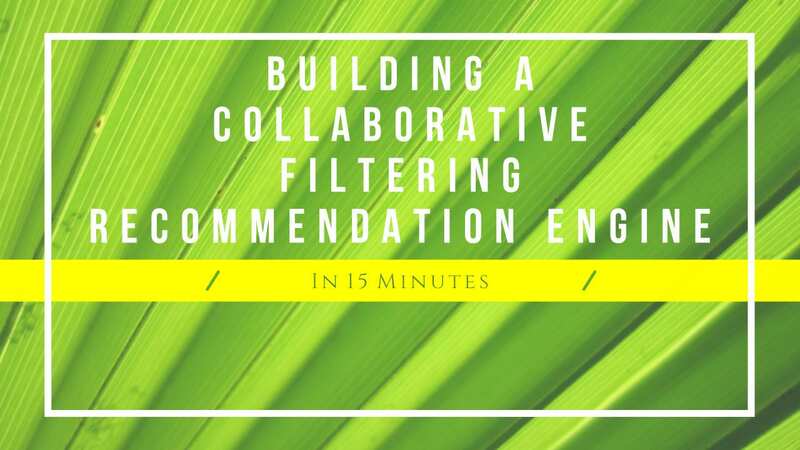 There are generally two types of recommendation engines – Collaborative Filtering Based and Content Based. Sometimes the hybrid models are also used. Collaborative Filtering Models: are based on actions and behaviour of users. For example if a person having interest in thriller movies, is purchasing a set of thriller movies, another person having similar interests is also likely to buy same set of movies. Content Based Models: are based on the features of the products, items with similar content are clustered together, and recommended together. For example – Apple Iphone and Apple Ipad belongs to one cluster of apple products, samsung phone and apple iphone belongs to one cluster of smartphones. In each of the algorithms, the similarities between different items are calculated using any similarity measurement technique, such as – cosine similarity, vector similarity, levenshtein distance and edit distance etc. These similarity values are used to predict ratings for unobserved user-item pairs. Let’s take a scenario for an ecommerce company, where a large number of users actively buy large number of products/items. To maximize their sales, The company wants to identify which of the brands are similar according to user behaviours and their buying patterns. For this task, company has collected a data for users of random shoppers and the brands they purchased. The task is to create a model, that will recommend most similar brands with respect to a new brand. The complete data can be downloaded from this link. It contains three columns – “User Id”,”Brand Id”, “Brand Name”. Type of Products sold by them, example – cloths brands, sports brands, cars brands etc. Gender – for which gender the brands are famous for ? example – male brands, female brands. Parent Company – which is the main parent company for the brands. ? Do they belong to the category of expensive brands vs average brands ? People Interests – which people interests are important. Since the data consists of about 11K brands, it is important step to normalize the data and get rid of weak data points, Hence all the brands below a certain threshold value are ignored from the data. For example – in this data, bottom 10% portion is discarded. Please feel free to suggest more data normalization techniques in the comments section. Next, we need to perform similarity measurements and identify the possible similar items for one item. For every row, the sorted values will indicate the possible similar brands. The function named get_most_similar performs aggregation over the brand – brand matrix, sorts the data and find the most relevant – similar brand. The full code can be downloaded here. This tutorial explained the basics of collaborative filtering in python, obviously there exists more complicated and advanced techniques to cluster items based on user behaviour such as singular vector decomposition. Feel free to shoot out your queries in the comments section. Shivam Bansal, Data Scientist with over 3 years of experience in analytics industry, He is working with various aspects of data science which includes Machine Learning, Natural Language Processing, Statistics and Big Data Architectures.